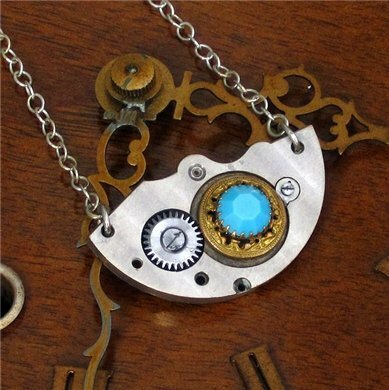 I am absolutely fascinated by Julia's re-purposing timepieces into jewellery. They are the same, but not, with cleverly designed abstractions inserted into a previous existence. 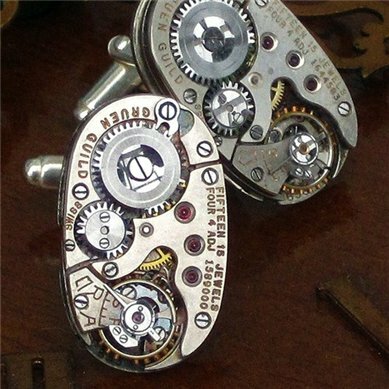 Her cufflinks are stunning, something the hipster male would love to have on his cuff. How fortunate we are to have such pieces in our view. Who is Relique Vintage Jewellery? Relique is as the name suggests, jewellery made out of ‘relics’. I take beautiful, precious things and turn them into contemporary styled mini works of wearable art. Getting stuck in my own space on the floor with ideas, notes, materials and whatever I can find all sprawled out around me. I somehow manage to create at my best when I am surrounded by everything at hand in a chaotic mess. What? There’s a table under there? I spy a Peppermint Magazine, my journal for getting ideas down in (for some reason they always come in the middle of the night), a lamp, my teapot for one, a couple of books I meant to read are under there somewhere too, this mornings newspaper and a few toy matchbox cars (courtesy of my 2 year old). Ok, I need to tidy up. I am also a painter so I find huge inspiration for my jewellery in art magazines and books. I can’t get enough of NZ artists Ralph Hotere & Colin McCahon. Often I like to create in total silence but when I have music it’s usually of International flavour like Gotan Project. Anything that gets me laughing so hard I have tears in my eyes! I have quite a satirical sense of humour and love it when company can really get you laughing about the simplest things in life. Good question! Don’t think I have the exact answer to that. It all seems to work in somehow but I have to be careful not to let the creation creep on over to my family time. Is there an off-switch somewhere? Anything that ends up completely different to what I had in mind when I first started. Sometimes I go WAY off the beaten track! I have a studio but do a lot at the kitchen table. It’s warmer, brighter and has people around it. Number 1 is to get to Italy one day and travel around the countryside wine and food tasting. I want a big vege garden instead of growing in pots and a number of art books and paintings that I can never afford. A lovely interview Julia - Your sense of humour is evident throughout your blog posts and comments... they make me smile in turn!! Thanks for your awesome comments guys... and Carol, the Night Market was unfortunately cancelled due to extensive damage to the venue from the Sept 10 earthquake. But it will be back this year better than ever ... keep an eye on http://www.facebook.com/thenightmarket for details. Your pieces are intriguing Julia. Love your work as you already know Julia :). There are stories and a history to each piece that is simply fascinating.